With this in mind, we offer 10 principles for racial justice activists to effectively resist state repression of our movements. P.P.S. 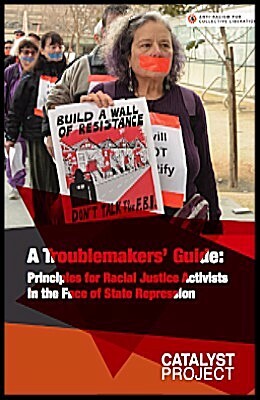 If you’re in the Bay Area, please join us on August 8th for the launch event for this pamphlet, featuring: Cat Brooks, Anti Police-Terror Project; Isaac Ontiveros, Center for Political Education; Lara Kiswani, Arab Resource and Organizing Center; Maisha Quint, Eastside Arts Alliance; and Donna Willmott, Catalyst Project.